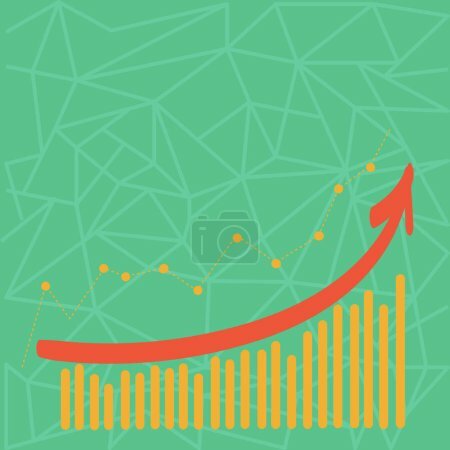 Фотобанк Rusmediabank – лицензионные Фото, Видео, Музыка - Combination of Column and Line Graphic Chart with Arrow Going Upward in Colorful Pastel Shade. Creative Blank Space Color Background for Presentation, Report and Financial Matters. Combination of Column and Line Graphic Chart with Arrow Going Upward in Colorful Pastel Shade. Creative Blank Space Color Background for Presentation, Report and Financial Matters. Combination of Colorful Column and Line Graphic Chart with Arrow Going Up Design business concept Empty copy text for Web banners promotional material mock up template.